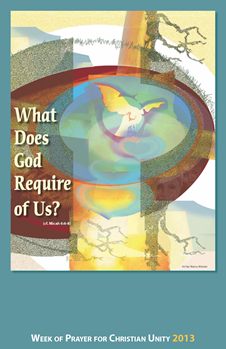 The Graymoor Ecumenical & Interreligious Institute prepares and publishes the resources for the Week of Prayer in response to the call to pray for unity … unity among Christians, unity among the churches and unity in the human community. These resources have evolved over the years owing to the developments in the ecumenical movement. Changes in their form and content also come from comments received from those who engage in local observances of the Week. Among these in recent years are resources in Spanish; resources which reflect the ecumenical convergences related to worship, for example, use of the New Revised Standard Version of the Bible and of a common confession of faith; and sensitivity to the interreligious context in which the Christian oikoumene finds itself. To make the WPCU resources available to a wider constituency, they appear on the internet. As the GEII continues to evaluate its WPCU resources, it invites those who used them to respond to the following. Please send your response to the address above.